Early cancer screenings can be life saving. But traditional diagnostic tests are time consuming, costly and involve some level of an invasive procedure -- a blood test, mammogram, pap test, biopsies. Now, a newer diagnostic option developed by IBM aims to make cancer screening non-invasive, fast and cheap. The alternative method, called "lab-on-a-chip," boils down the conventional cancer screening process by using a small silicon chip and body fluid like urine or saliva. It could deliver screening results in just a few hours and reduce costs by as much as half. IBM Research teamed up with Mount Sinai Hospital more than two years ago for the project. The silicon chip developed by IBM. Here's how it works: The screening requires a patient sample to get started. The sample includes a drop of body fluid -- not a tissue sample, which is typical with biopsies. The process tests the liquid for exosomes, known as tiny sacs of cellular material encased in membrane. 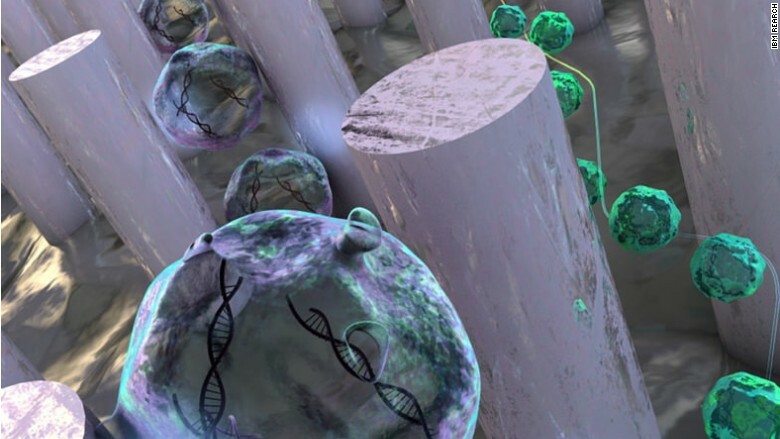 IBM's technology then separates the exosomes from the liquid sample, which contains vital genetic information. The non-invasive nature of the approach makes screenings easier and ultimately possible to detect cancer when it first emerges. 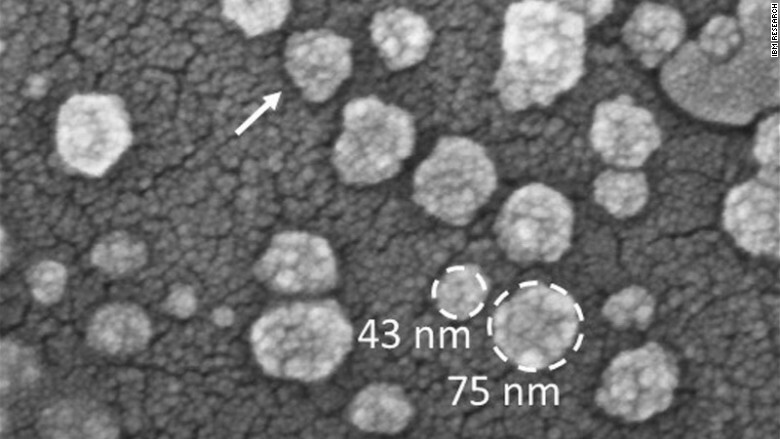 Exosomes viewed through a microscope. 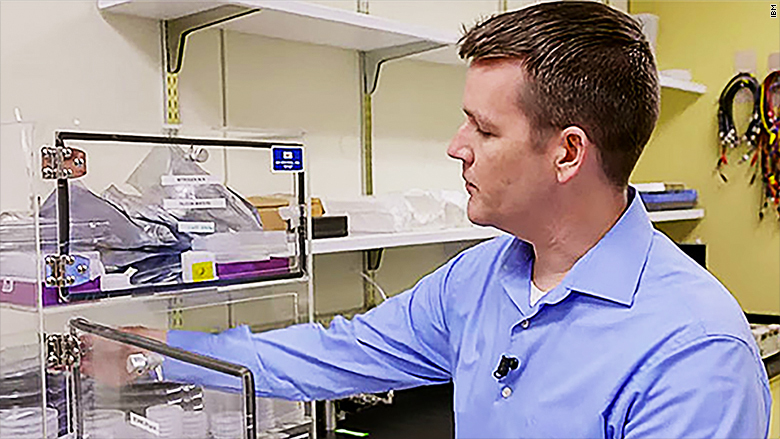 "We realized in the last few years that exosomes aren't trash bins filled with garbage being thrown out by cells," said Dr. Carlos Cordon-Cardo, Chair of Pathology at Mount Sinai Medical Center, in New York. "They provide very important data about the mother cells, including DNA, viruses and biomakers, to help us with early diagnoses of cancer." A team at IBM Research, led by Joshua Smith, designed the chip that's placed into a cartridge with up to a milliliter of fluid sample. The chip itself includes a pattern of columns. Meanwhile, the technology -- called nanoDLD -- allows the patient's sample to flow through the chip's columns, which separates and sorts small exosomes from larger ones. "You can visualize the separation process like traffic on a highway that separates into two roads with one going into a low-clearance tunnel and the other going around it," said Smith. "Smaller cars will go through the tunnel and larger vehicles carrying potentially hazardous material will be forced to take the detour route. Traffic is effectively separated by size and contents." The unique column pattern on the chip helps separate exosomes for easier screening. This simplifies the exosomes screening process. In addition to being a diagnostic tool, the system could allow real-time patient monitoring. "We can quickly test how patients are reacting to medication or if even they've developed resistance to it," said Cardo. "This way we can detect side effects much sooner and also avoid unnecessary treatment." The ability to sort and identify biomarkers using chip-based technologies opens the door to quickly and effectively identifying other chronic diseases, as well as viruses like the flu or Zika. However, it's about three to five years away from broad adoption and is still undergoing clinical trials. IBM's Joshua Smith leads the project. "Before it's commercialized, we must make sure results are accurate for thousands of tests," Cardo added. Insurers also need to be educated about the diagnostic and cost benefits. Looking ahead, Cardo is optimistic the lab-on-a-chip diagnostic technology could hit mainstream use -- even during annual exams. "We are caring for people when they become sick right now in healthcare," said Cardo. "But this [process] could become a low-cost way to test and monitor patients before. This would help us get ahead of diseases so we can treat them much more effectively."